Learning a new language can appear quite daunting, especially in a class full of strangers. Our day and evening conversation classes in French are delivered in a fun and relaxed atmosphere. Our classes are smaller than most (with a maximum of 8 students) and the friendly atmosphere can dispel any anxiety you might have regarding taking up a new language. Lise Morel has nearly 20 years of experience in conversational evening classes, and knows all the tricks of the trade – you will quickly speak (and listen! ), through a range of interactive techniques. New classes start every term! Please feel free to contact Lise for a free assessment or for more information about the classes on 0131 667 3999. A choice of tea, coffee, water or herbal tea is available free of charge during the lesson. 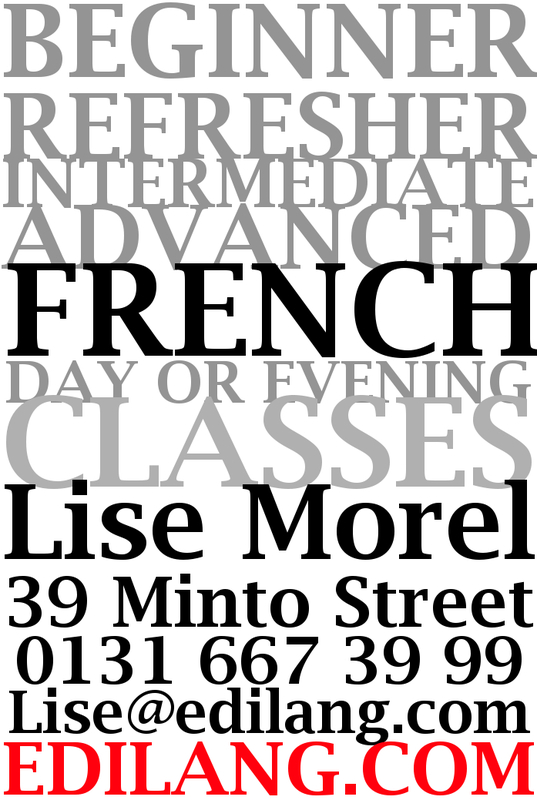 Lise Morel has been training adults since 1990, and she is able to offer group tuition with a tailor-made feel. Every term, over 70 people enrol in her classes, driven by her expertise and enthusiasm in a friendly atmosphere which enhances learning. The classes Lise is offering this term include a lot of different levels, which will help you improve on your French, whether it is existing, or whether you actually want to develop it! During the classes you will practise your French in a fun and interactive way, through various activities and games techniques. At some levels, film or radio extracts will enhance understanding of rapidly spoken French. If you would like to practise your French with other equally fluent speakers, please have a look! In the meantime, please do feel free to browse through this website: its vocation is in effect to serve as a portal to all learners of French, with something for everyone. Let us know if you’d like to see something that has not been yet included! Where? The classes take place in Minto Street, near the city centre. Class size*: Minimum 4 students; Maximum 8 students. Anything else? Just ask me! Feel free to contact me for any other information. I will be happy to answer any queries. *It is essential for a language class to function well to keep class size at an absolute minimum: we will never compromise on quality for financial reasons.